Or eight-inch-tall spectral esper manifestations. got the info I need for a basic version, which should be PTR compatible. Will try to code out the basics today. So if anyone wants to make a layout, or has an idea for a layout, please tell me. How intensive will that interface be in terms of pulling info to populate? One of the issues I have with super fancy add-ons with custom interfaces that pull information in the manner these do is they're sort of resource hogs. 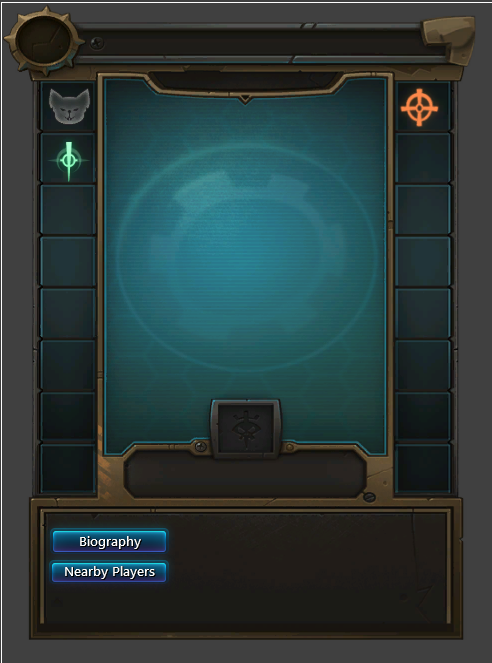 Really, I think this should go the TRP or MRP route (if anyone is familiar with those WoW add-ons) -- a tab for description stuff, a tab for history stuff if people really feel like they need it, an option for custom titles and a little button of some merit that lets us access that profile. With the quality of models we have in-game, I don't think a displayed image of the person is strictly necessary. population will be done a need-pull principle. Structure I'm still playing around with. I do not have much time to work on addons, so it will take time to finalize it. Yea, I thought it looked familiar when I saw the sprite templates in Houston. Would it be helpful if we try to present some design ideas for potential templates? I was messing around with Templates and Sprites in Houston. I learned you could add tab buttons and stuff, but I couldn’t figure out how to add text (much less extract the fonts) which is why this looks like a poorly made Photoshop chop-job. I know diddly nothing about addons, but I'm a stickler for simplicity over complexity. Home would be as you see it. Very basic information. 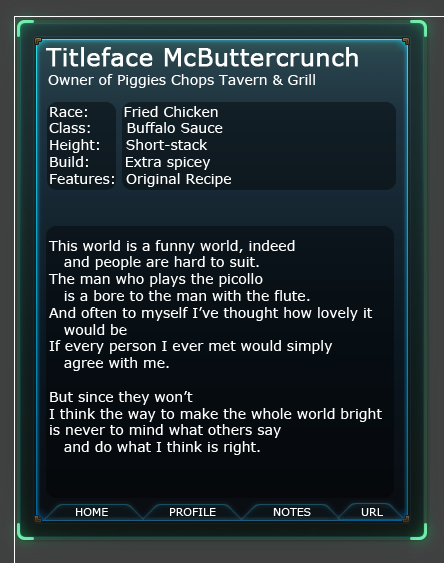 Profile is a more extensive view of the character where the RPer can add very specific details. Notes would be anything noteworthy, such as if the character had a bounty, if they’re involved in a plot, or anything else you’d want to put. URL window is for quick copypasta URLs to things like a character sheet, thread profile, twitter, or tumblr. It's amusing to see the development here and how much it looks like early PDA. I'll look at a UI for you this weekend. As I wrote on Tumblr, going to use that image as base. No heavy graphics, we're going minimalistic. When I find some time today, I will redo the layout and upload to github. Then I will work on releasing features step by step, so don't expect a working version until v1.0 comes out. Tab window requires a default layout to be defined. And is duplicated on each tab. It's probably opening the window upon reload because I'm guessing the chat window protocol is made to bring it up after refresh, and whatever is in the code you pulled is linking it to that trigger. 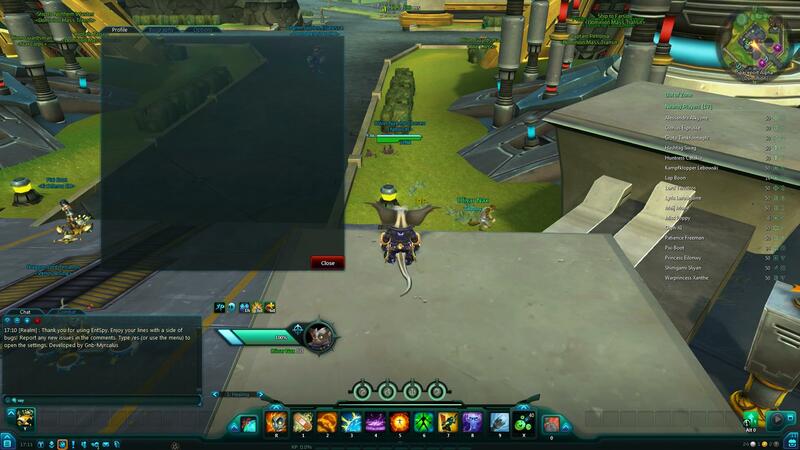 I haven't done anything in Wildstar's addon building, though, so that's just me hazarding a guess based on what you said.